HER BEST STYLE: We're honoring the long, straight look of her adolescence. It was parted a slight bit off-center, with hair draped fractions of an inch from her eyes. 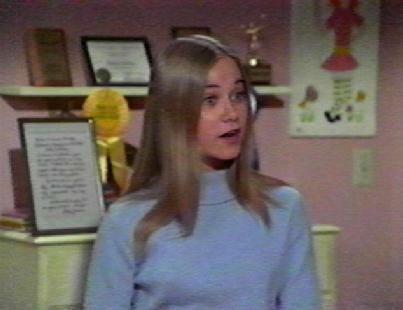 HISTORY: No list of ultimate styles would be complete without TV teen Marcia Brady. When it was unpinned, it hung so near to collapse that hair watchers knew it had to plop in her eyes eventually. But she was in many ways The Perfect Teenage Girl of her time - with remarkably perfect hair to match. Her style often refused to budge, even when at the brink. WHY SHE'S RANKED HERE: "She's above Cindy Crawford?" Yes, but not by much. It's because her hair held a bit tighter. But as we say, it had to plop down eventually - which it did, but not without a fight. You can find a few examples at the "I love Maureen" web site, which we thank for our background photo. © 2000-03 www.super-hair.net All rights reserved.